A teacher has been arrested in Japan and charged with stabbing a schoolgirl to death in an argument. Sayano Horimoto, 12, was killed in a classroom on Saturday, becoming the third child to be murdered in Japan in the last three weeks. Japan's justice minister has warned of a chain reaction of killings. Serious crimes are rare in Japan but recent child murders have prompted parents to demand increased security in schools, our Tokyo correspondent says. 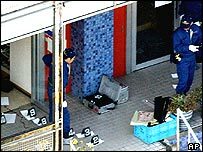 The shocking, inexplicable nature of the killings has prompted many Japanese to ask if something is wrong with the moral climate in their country, the BBC's Jonathan Head reports. Yu Hagino, a 23-year-old teacher at a private school in the city of Uji in Kyoto prefecture, has been arrested on suspicion of killing the schoolgirl, police said. "The suspect has said that he stabbed the student after getting into a verbal dispute," a police spokesman said. Local media said the suspect had told police the girl had mocked him. Police said the classroom's surveillance camera system had been disabled before the attack, which was carried out with a kitchen knife. In two recent, unrelated incidents, the body of a seven-year-old child was discovered strangled and taped inside a box in a car park. The body of another child of the same age was also discovered, stabbed and left in a forest. A Peruvian man was arrested over the first killing. "This is truly sad," Japan's Justice Minister, Seiken Sugiura, told Kyodo news agency, in response to the latest murder. "We need to prevent a chain reaction. I would like to carefully study the incident and think of steps that can be taken," he said. According to our correspondent, the minister's warning appears unnecessarily alarmist, as there is no evidence that violent crimes involving children are rising in Japan and no link between the three latest murders. But parents are calling for better security on the long walk that customarily takes many children to school. School uniforms fitted with global positioning transmitters are being sold and some schools have fitted sensors in their gates that inform parents their offspring have arrived safely.